With a wealth of deposit options, and 100 percent free payouts available (something of a rarity for American bettors), you’ll find moving your money and winnings around a breeze, and who doesn’t like that? Choose WagerWeb for your sports betting endeavors and you will not be disappointed. Choose from three bonuses when you create a WagerWeb account, ensuring you select the one that suits you best. The High Bonus Special awards 50 per cent cash (or 75 percent free play) with a 15x rollover. WagerWeb, like the vast majority of major online sportsbooks that accept bettors for the United States, operates via a gaming license out of Costa Rica. Since the jurisdiction does not apply in this case, because WagerWeb operates outside of the U.S. border, American players are coveted and WagerWeb caters its site offering to the U.S. bettor. WagerWeb has one of the most extensive list of betting markets available anywhere online, and all with impressive, competitive betting odds. All the major North American sports are there to bet on, including NFL, NBA, college basketball and football, soccer, MMA, golf, hockey, and more than a dozen others, each waiting for you to try your luck at and begin to add up your winnings. There is also a dedicated racebook for you racing fans. You will also find an array of different bets to make, certainly not limited to the usual moneyline and parlays, you’ll also find Round Robins, reverses, and many more, including live betting. WagerWeb also regularly offers intriguing prop bets on both sports and entertainment. How many will you try? In addition to the trio of welcome bonuses, WagerWeb customers can enjoy sportsbook and casino cashback options of one per cent, paid weekly in the form of a free play. Deposit $100 or more within 24 hours and WagerWeb will give you an extra five per cent added to your next deposit bonus for free. And there is no additional rollover requirement. Also, your 10th deposit is free at WagerWeb. Make nine deposits in a row without taking a payout and you'll get the 10th one for free. Your deposit amount will be the average of the last nine deposits. Deposits into your WagerWeb account via credit card, pre-paid credit card, gift cards, or debit cards are available, with credit cards being free or charge. You can also withdraw to credit cards, although you may have to complete a credit card authorization form. The sign-up process is quick and smooth and WagerWeb's customer service agents are easy to reach. WagerWeb is usually quick to pay, promising same day payouts. They allow you to make one free withdrawal per month. WagerWeb’s customer support teams is available via telephone or facsimile from 10 a.m. EST until the last half time of games being played that day. It is highly unlikely that you will need to contact them, because with more than 20 years of operating, WagerWeb has had plenty of time to iron out any bugs and gremlins. Another attraction to making your bets with WagerWeb is their loyalty program, which is among the best in the business. With every bet you make at WagerWeb, you earn points toward rewards. The points add up quickly and can be cashed in for smaller prizes like books and gift cards, or collected to grab larger offerings such as iPads and XBox games. 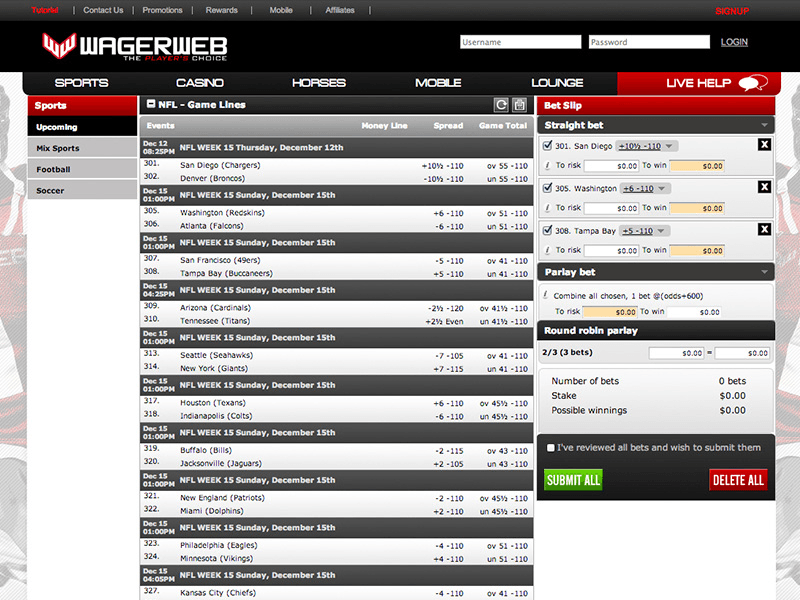 Among the unique features at WagerWeb is they allow you to place parlay wagers across different sports. You can parlay your Monday Night Football pick to your hometown college team and your golf pick of the week. WagerWeb offers the largest selection of Teasers and pays out true parlay odds. They also permit you to buy back points if you don't like the spread on a game. You can buy or sell up to five points per game. WagerWeb's betting opportunities appear limitless, as their offer a vast selection of sports on which you can wager to you heart's content. Think you have a feel for the flow of a particular game? Then why not cash in on your intuition and make a live bet wager on the game at WagerWeb? You can bet on the game as it plays out, and get in the action at anytime. With WagerWeb's live sports betting options, the action doesn’t stop with the whistle. No more online games off the board or boring time outs and play reviews. With live sports betting there is never a dull moment in the game. Think your game pick might not pan out? Bet when the tides turn and recoup from a bad referee's call or a Hail Mary pass. WagerWeb's mobile betting platform not only allows you to wager on games from anywhere you might be, it also makes it much faster for you to get that wager down. Use their new cart feature to make different wagers at the same time without having to confirm each individual bet, saving you time, so you spend more time enjoying your games and less time placing your wagers. With their streamlined mobile betting interface, you will place your bets safer and faster than ever, and have access to all the normal wagering options - straights, parlays, round robins, if bets, teasers, and point buying. WagerWeb has been accepting bets since 1994, and since its launch it is obvious that the management has invested heavily in the WagerWeb website. Everything about the WagerWeb website oozes quality. 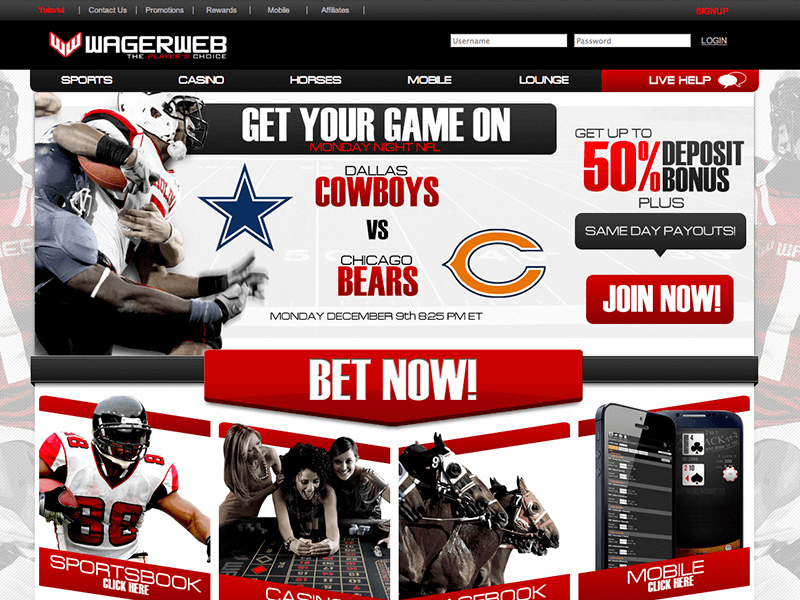 From the choice of colors and fonts, to the excellent high definition imagery, to the speed with which pages load, the WagerWeb website is a credit to the company, and definitely up there with the best sports betting sites in the world. WagerWeb wants to make your casino gambling experience more exciting by offering you a huge selection of online real money casino games. Their range of online casino games includes Triple Crown, Lucky 7, Black Gold, and Double Joker, among many others. And they will give 50 percent back on you net casino losses every Monday. From the Kentucky Derby to the Breeders' Cup, at WagerWeb you can place your bets on all major thoroughbred tracks in their racebook. Close Visit WagerWeb and see for yourself... Bet now!